Spots on jumpsuit only printed on the back of the suit. Look just as adorable as the beloved pet of the Flintstones, Dino. This purple jumpsuit with black spots and tail attached, foam headpiece and collar will have you looking your best in no time. 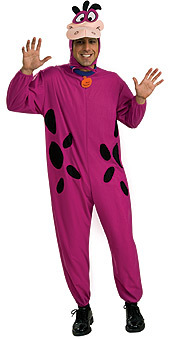 Everyone will recognise you in this bright and fun Costume as Dino form the Flintstones. One very affordable and effective Costume!